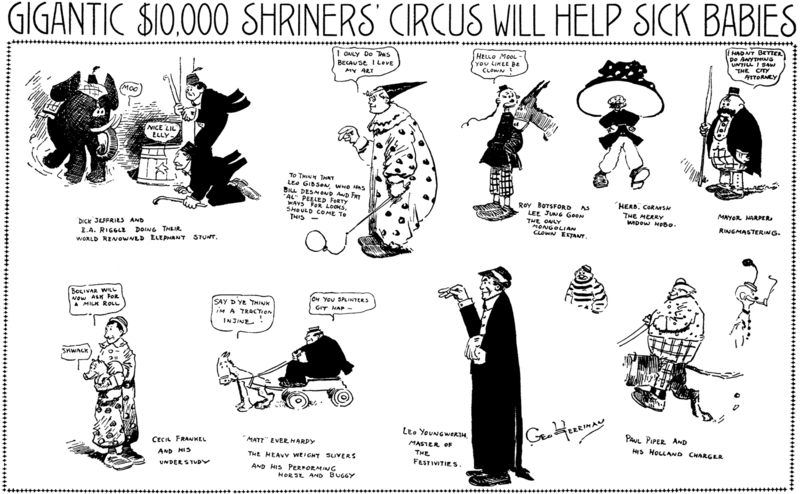 Sunday, April 5 1908 -- The Shriners' Circus, which debuted in 1906, comes to Los Angeles this week, and features turns by local celebrities along with pro circus performers. 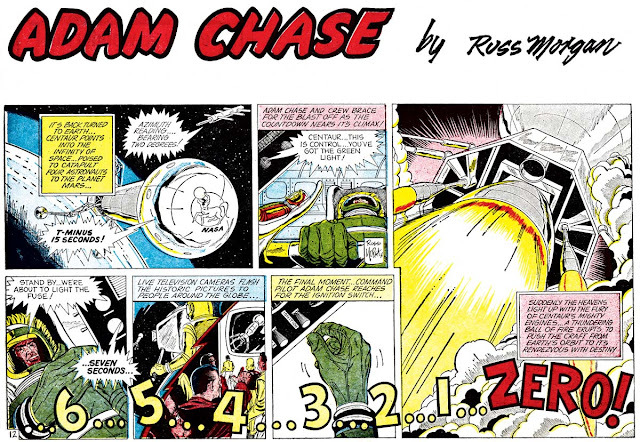 Adam Chase strip #12, originally published August 21 1966. For background on the strip and creator, refer to this post. I have a faint memory that in the 1970s one of the Seattle newspapers had a strip that only ran there. Does that ring any bells? Perhaps you're thinking of Cecil and Dipstick by Ray Collins. It was in the Seattle P-I. 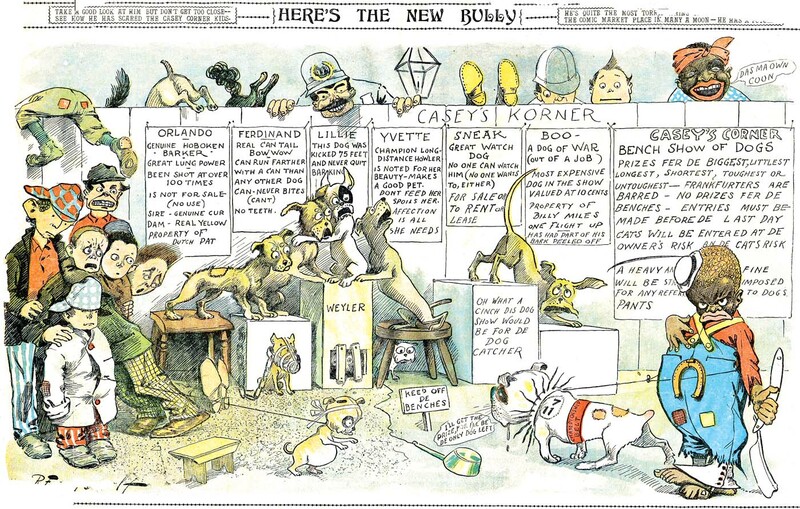 Richard Outcault's The New Bully is sometimes mistakenly called the first comic strip series to star an African-American, but it doesn't really have that distinction. 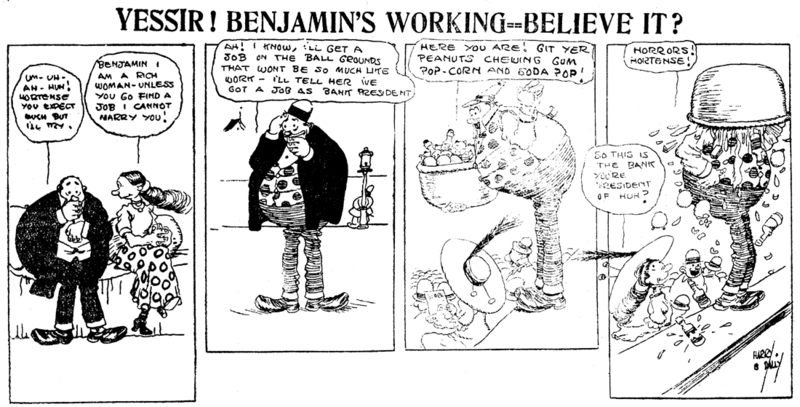 The New Bully series began on February 13 1898, which means it trailed by a full year E.W. Kemble's The Blackberries, which is more likely to claim that title. What The New Bully does have is a practically unique star. 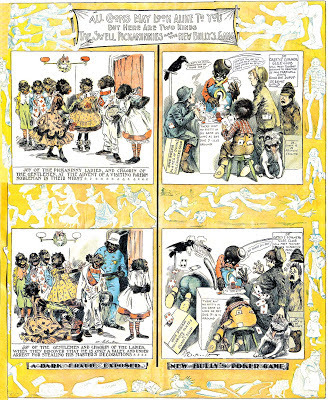 If you visit Stripper's Guide regularly, you are quite familiar with the common types of black characters in early newspaper comics, in pigeon-holes like the lazy man, the marble-mouth, the mammy, and the pickaninny child. However, The New Bully exhibits a black archetype that is unlike these. While the vast majority of the funnies' black characters are designed to be non-threatening to white newspaper readers, The New Bully is a violent and frightening type, something we very rarely see. The New Bully has no fear of whites; he's amoral, violent, and has a hair-trigger temper. He brandishes a giant straight razor that he seems to have compunctions about using, and he's followed around by an attack dog at the ready. This is the black man who gives whites nightmares. He's a portrait of all the savagery that whites hope has been bred out of Africans by slavery and centuries of unremitting harsh treatment by whites. But in the backs of their minds, they know that a desire for revenge and capability for violence must burn bright, and the strong black man is a source of nightmares. 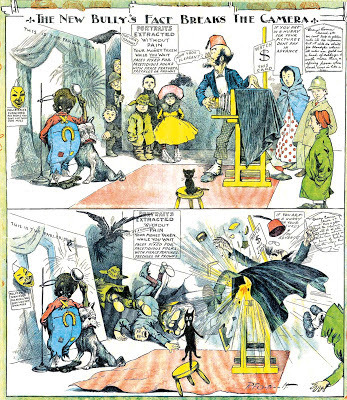 Outcault created this series for the New York World after he had already accepted a position with the New York Evening Journal. So did he offer this series to Pulitzer's World as a poison pill, or did he honestly think the public would respond positively to The New Bully? As unlikely as it seems, the latter may be true. In 1895 a new song hit was making the rounds, titled May Irwin's Bully Song. This chilling ditty tells the story of two black men who vie for the title of being the biggest bully in town. The lyrics are racist in the extreme and horrendously violent, but if you'd like to read them, go take a look here. 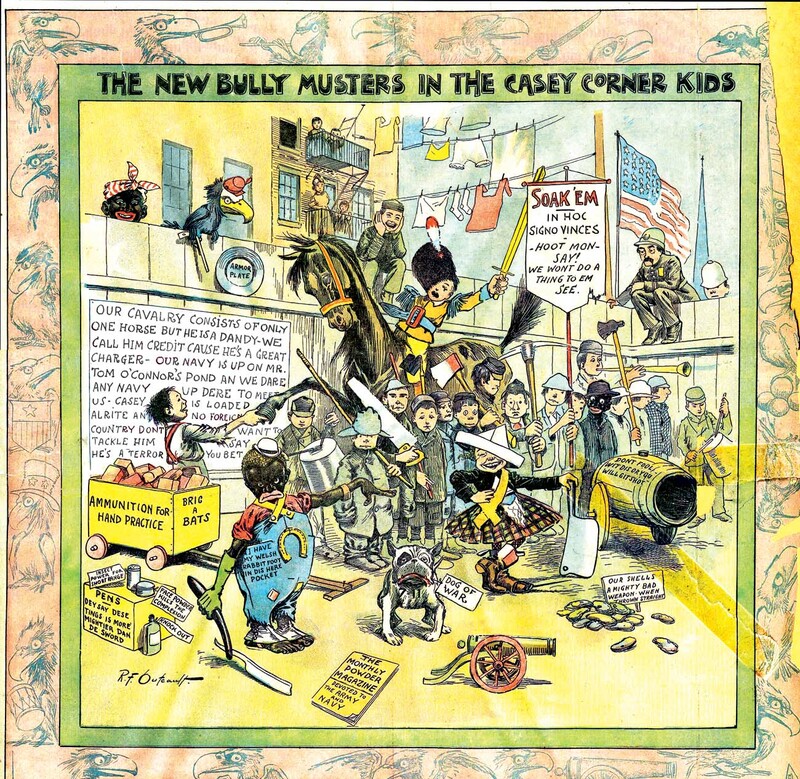 In 1896 the hit song was reprised by several other 'bully' songs, including one titled The New Bully. I can't make much sense of the popularity of these songs, but the fact is, they were popular. Outcault is obviously trying to ride on the coattails of this 'bully' fad. However, the big mistake he makes is veering away from the formula in the songs. In the song lyrics, the violence is black-on-black. In Outcault's series the violence, or rather the threat of it, is directed primarily at white folks. My theory is that the songs were popular because it was just fine with whites if those blacks want to carve each other into hamburger. But when the violence looks like it may be directed at whites, even if it's only a threat that is never acted upon, well, that's a horse of a different color. Outcault's series, not surprisingly, was short-lived. It ran from February 13 to April 17 1898. When he next returned to the realm of black children in 1900, he went with a more traditional stereotype -- an unthreatening and downright cherubic pickaninny -- in Pore Li'l Mose. The taste for this sort of thing must have lasted quite a while. Among my 78 RPM records I have 1940s recordings by Phil Harris's swing band of two "black people carve each other up" songs: "The Darktown Poker Club" and "George Washington Abraham Lincoln Ulysses S. Robert E. Lee." I assume they were covers of much older songs. They were played for laughs. Though racial epithets and Amos 'n' Andy dialect were removed, there's no question who Harris is talking about. Perhaps envy was part the genre's appeal. The imaginary wicked world of free-spirited people with high passions and loose morals may have provided vicarious thrills to "respectable" white audiences. Allan, ever hear of Goldtiger? Joakim Gunnarsson posted about it on his blog. Jay Irving was born in New York, New York, on October 3, 1900, according to the New York City Births, 1891-1902 record at Ancestry.com. His birth name, Irving Joel Rafsky, was published in Life magazine, February 11, 1972. The 1910 U.S. Federal Census recorded him in the Bronx, New York at 858 Kelly Street. He was the oldest of three children born to Abraham and Sarah. His father was a lieutenant in the police department. The U.S. Marine Corps Muster Rolls, 1798-1958, at Ancestry.com, said he enlisted November 26, 1917; his name was recorded as “Irv J. Rafsky.” He was in Company “I”, and stationed at the Marine Barracks, Paris Island, South Carolina. In March 1918, he was assigned to the 135th Company, 11th Regiment, U.S. Marines, and stationed at the Marine Barracks, Quantico, Virginia. The following two months he was with the Anti-Aircraft Battalion. Draw Me a Laugh runs about 10 minutes too long, a common failing among cartoon teleshows, and impresses, if properly trimmed, as being a salable property. It has a multiplicity of gimmicks, many of which show considerable inventiveness, and it has certainly come up with something new in the use of a quick-rhyming balladeer to cue in some of the other gimmicks, including the prizes awarded to viewer-contestants. The folk-singer, Oscar Brand, does a capital job, adding considerably to the show’s enjoyment. The basic gimmick is a contest wherein viewers submit gag lines and cartoon ideas to match. These are quick-sketched by Mel Casson, with a guest cartoonist competing. The latter is given only the gag line and has to come up with his own sketch, a panel of four of the studio audience picking the cartoon they think the better of the two. Other gimmicks include a blindfold cartoon bit by Jay Irving, with Casson a regular on the show; impressions drawn by Casson and guester Bill Holman of a man described to them by Irving, but whom they are unable to see, and a doodle drawing bit by Casson. It’s just this excess of bits which detracts from the show’s total impact. 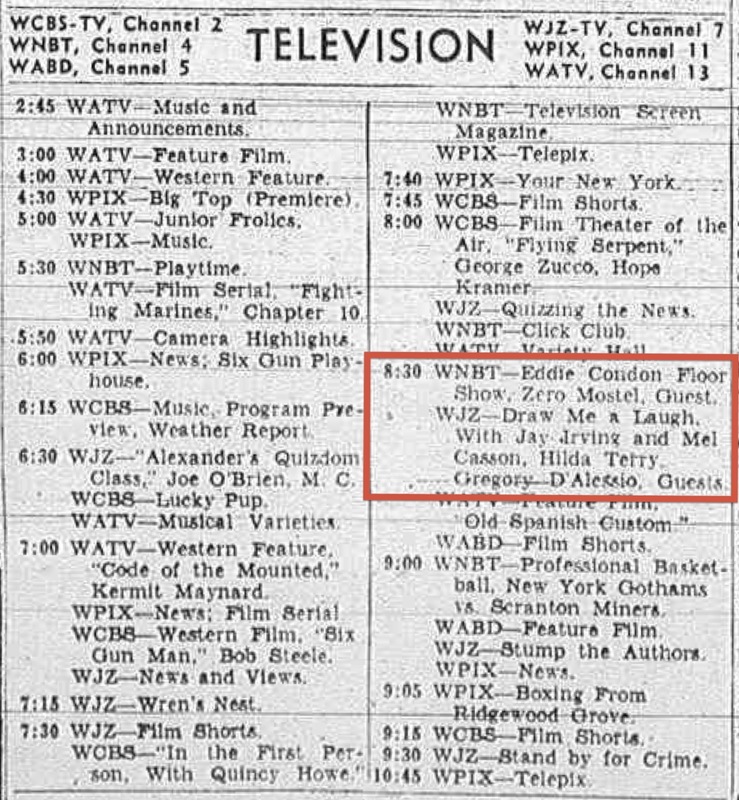 Anyhow, it’s about time that the formal 15-minute and half-hour pattern adapted from radio be given the heave-ho; here is a perfect instance where that credo is hurting a show that's too good to waste. 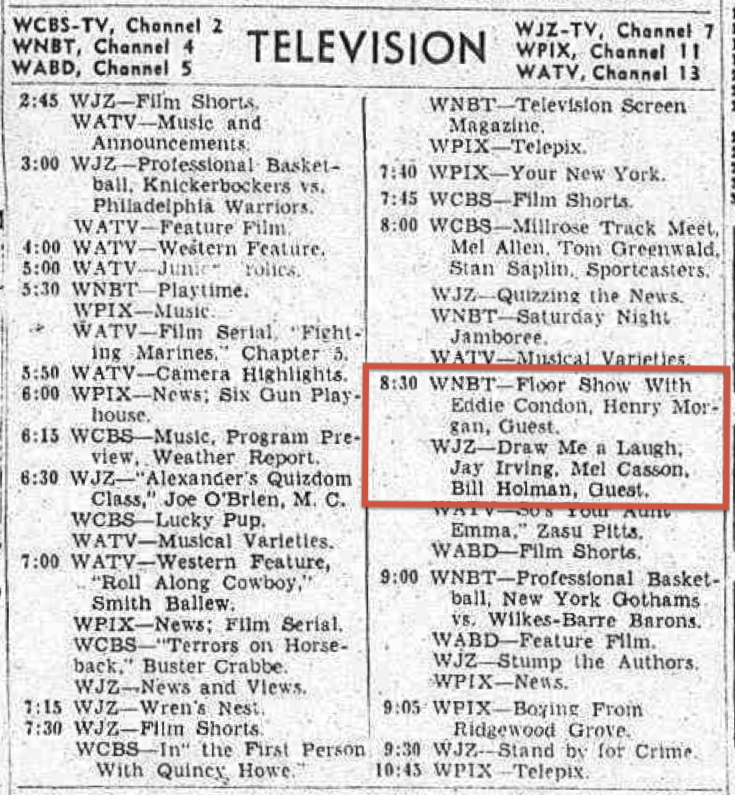 According to Stolzer, Irving and Casson produced another show, You Be the Judge, for ABC, which ran for 13 weeks. 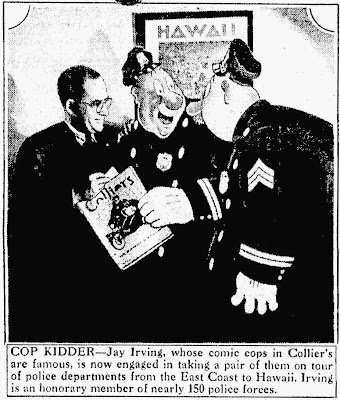 Jay Irving, who specialized in cop gags, drew covers for Collier’s, was a top magazine gag artist and drew a Sunday page, “Potsy” [sic], for the N.Y. Sunday News. Jay was the father of Clifford Irving, the writer who put over the hoax biog of Howard Hughes. It was Otto Soglow who rose to rebut Jay. On June 17, 1959, he was interviewed on the Jack Paar Show, according to the Oregonian of the same date. 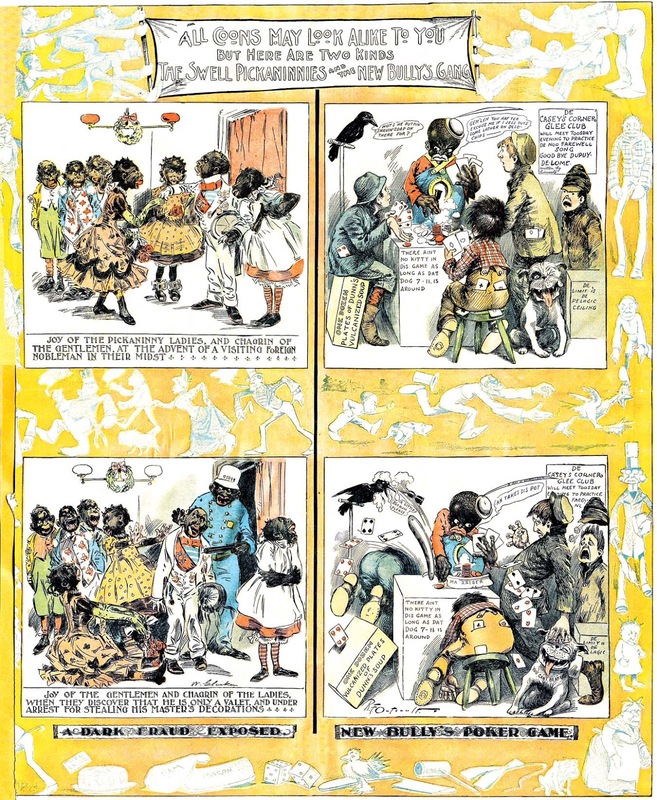 Stolzer said that in 1962 “…Irving was approached to write a 70-page chapter on the history of American comic strips….” for the Italian publisher, Aldo Garzanti Editore, whose book was titled, International History of the Comic Strips. The book was never published and Irving’s manuscript disappeared. He continued producing Pottsy. Stolzer’s in-depth profile is at Hogan’s Alley. 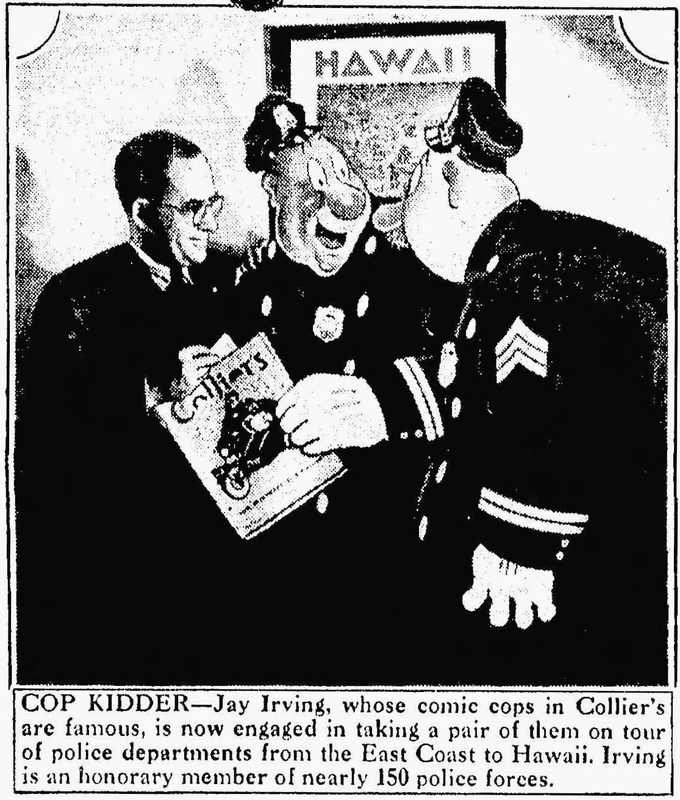 I have just been looking at about a lot of pages from the early forties that had Irving's chaming cop strip... and found only two worth scanning. As we've discussed before, World Color Printing was strictly a dabbler in the realm of weekday comic strips. 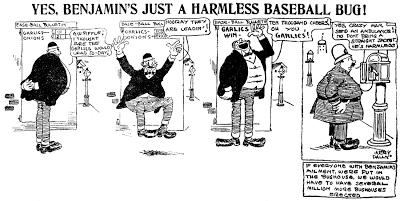 One of their longest running series was Ben, a delightfully silly strip about a fellow who is utterly bonkers about baseball. 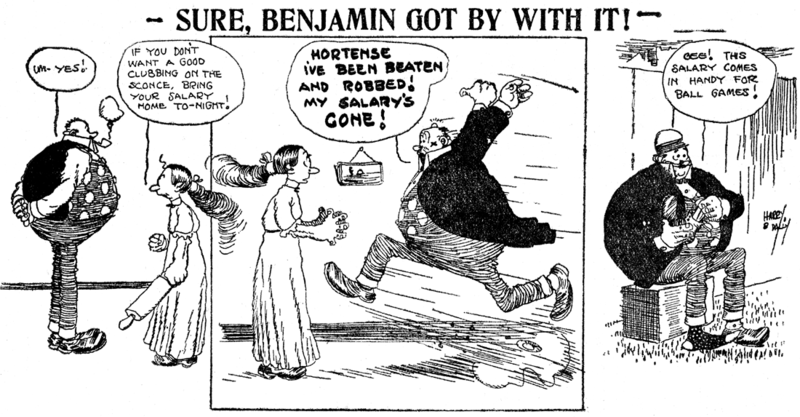 The strip debuted on June 12 1911, and at the beginning the strip should more properly be called Benjamin, as our hero's moniker had yet to be shortened. 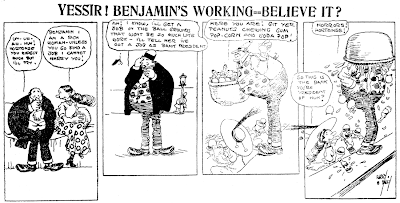 The feature was uncredited at first, but was probably by the same fellow who began signing the strip as Harry B. Dally on September 1 of that year. I don't know if Mr. Dally was a real person; it may have been a pen name. 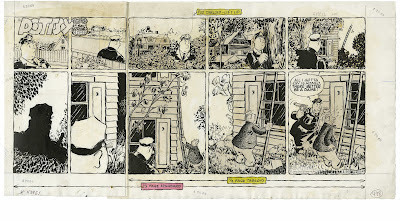 Dally disappeared for a short while in November, when the strip was taken over by a fellow who signed himself Herrmann. 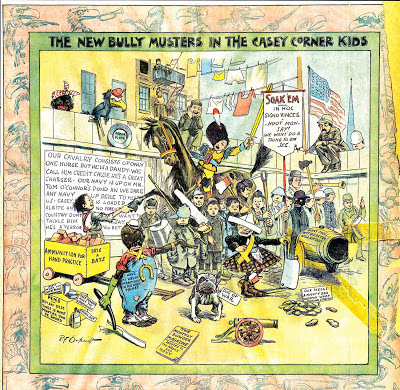 This cartoonist took over for Dally for about a month, and then Dally was back at the helm. The lack of a consistent run of this strip in any paper I've reviewed makes things even sketchier from here on. Given World Color's track record with dailies, the fault was probably theirs, not the subscribing papers. Dally continued to sign for a good long while, and then Carl Ed took over. The switch occurred sometime in 1912 or 1913 (I warned you that it would be sketchy!). Ed's turn took him through sometime in 1914. 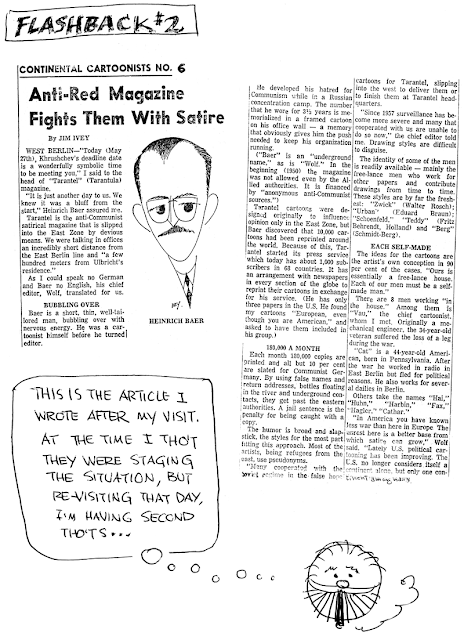 The final cartoonist was Budsee, who after years of head-scratching I finally figured out must be Bud Counihan. Budsee suffered the ignominy of working under Carl Ed's byline, but World Color didn't seem to mind that he sometimes signed the strip itself. 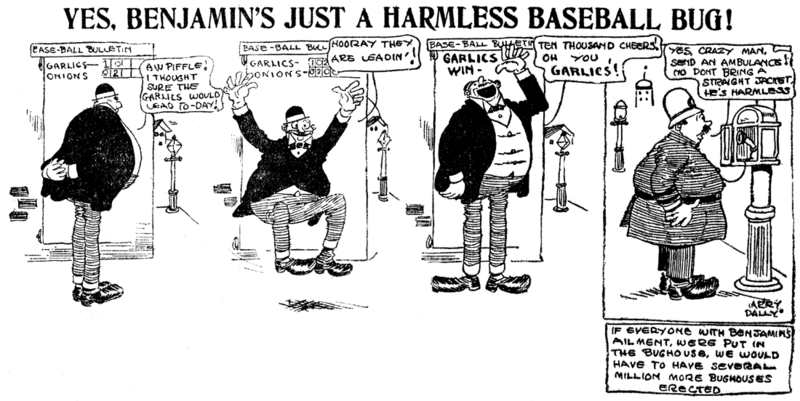 Counihan was at the helm until the end of the feature, which came on May 22 1915. The next Monday, Budsee/Counihan was back with his new strip, Luke McGlook, another baseball strip, but this one from the perspective of a player rather than a fan. Ben wasn't ready to retire though. No, World Color Printing specialized in beating dead horses. They offered the strip in reruns in at least 1919, 1922, and 1924-33. Hello, Allan----I think that Harry Dally might actually be Ray Ewer. Very similar letters, feet, character design, shading. Here's a fine strip, suited perfectly to today's newspaper comics market. Full House is a feature about a couple of twenty-somethings who, due to economic necessity, move in with the husband's retired parents. Ripped from the headlines, as the saying goes. Now you may say that the strip Dustin already has a similar niche covered, and you're right. However, I think it only fair that we give some points to Full House for beating Dustin to market by, oh, a quarter-century or so. It debuted on May 21 1984. Full House was the first and only strip on which Ralston Jones took solo credit. 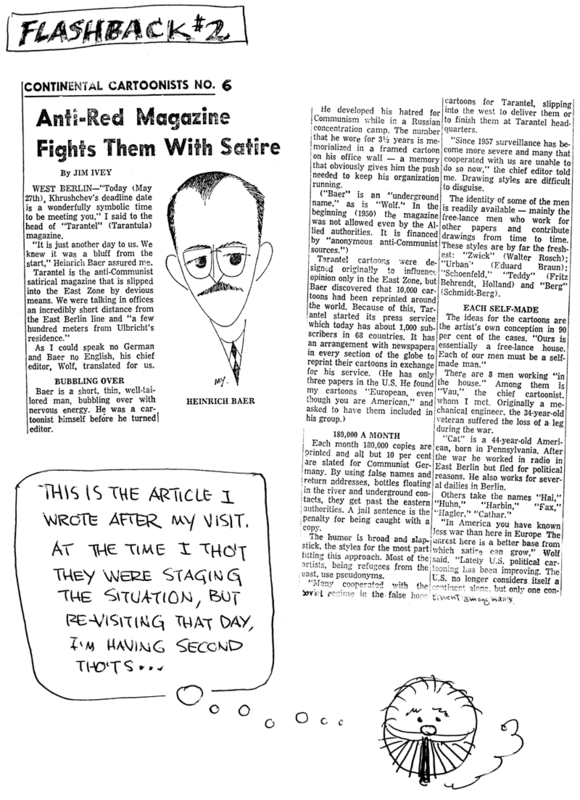 This fine cartoonist also had a long career working behind the scenes as a gag writer for major humor strips, and did the art on Mr. Abernathy for most of its run. Unfortunately, Jones seems to have been ahead of his time with the concept of kids moving back in with their parents. The Field Enterprises daily and Sunday strip started out with a small client list, and when that list adamantly refused to grow, either Jones or the syndicate threw in the towel. The strip ended sometime in 1985 (exact date unknown). I don't know when the Sunday started, but the last one was 1 September 1985, and the final daily was 3 August 1985. Thanks Mark! So that I can properly update my listing for the strip, what is your source for those end dates? The artwork looks like a better version of "Mr. Abernathy" without, you know, all the sexual harassment. See last Sunday's Jim Ivey's Sunday Comics post for part 1. Hello, Jim---Did they ask you to do any cartoons while you visited the TARANTEL offices? I'd like to see more of their good works. Understandably, this magazine is a rarely found collector's item, unlike it's evil opposite, soviet East Germany's EULENSPIEGEL. (Shamefully, the only American cartoonist I can think of to actually turn traitor, Oliver Harrington, spewed out his anti-U.S. hate for them.) --Cole J.